Camping is great—in theory. Spectacular scenery, fresh air, and lots of memory making with the family. But the reality of the gear, the setup, the leaky tent and the hard, hard ground sometimes makes it a bit less than desirable, especially with kids. 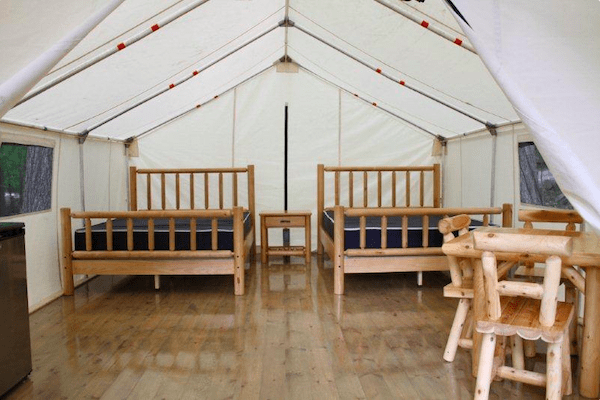 Enter family-friendly, comfortable camping options, aka “glamping”. All the benefits of the surrounding nature, with none of the set-up and soggy sleeping bags. And some of the yurts, pods, and cabins are so unique, the accommodation count as scenery. These options are popular in the provincial and national parks, so early reservations are required. Online booking opens on January 15 and 16 for national parks, and equally early for other park systems, so start researching now all the ways you can camp in comfort and style. Part tent, part cabin, the oTENTiks in Thousand Islands National Park make a wonderful place to relax after a busy day exploring the islands. The accommodation, solar-powered lighting and charging, a BBQ and Muskoka chairs are included, to name a few. More time for paddling, less time spent setting everything up! Enjoy comfortable beds and a woodstove inside your circular and spacious tent with lovely wooden lattice peeking through. It’s a wonderfully unique and comfortable way to explore the beauty of Cyprus Lake and Bruce Peninsula National Park. Now here’s a neat idea. 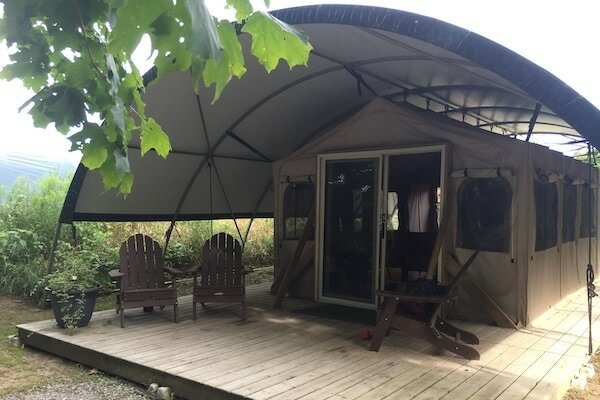 Moonlight Glamping isn’t the campsite—they provide all of the gear, set-up and take-down so that you can enjoy the gorgeous luxury tents and tipis in the locale of your choice, such as nearby Grand River Conservation Area featuring the awesome fun of tubing in the Elora Gorge. 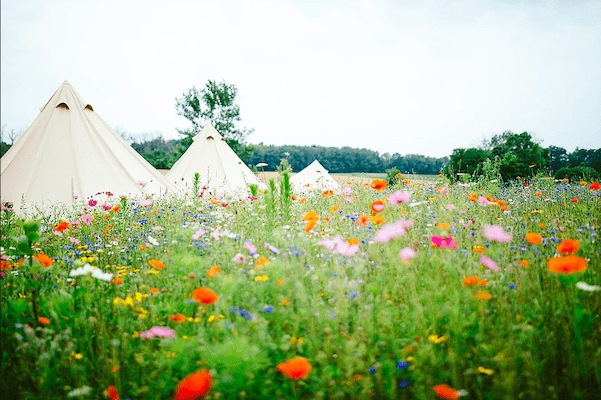 Or try out glamping at a family event! Moonlight Glamping will even arrange for a yoga session to round out your camping experience. Get out the camera, because these camping pods – camping and wilderness – are too cute not to get snapped. Plus, wilderness pods come with private flush toilets and all pods come with a full complimentary hot breakfast. While there, check out the ziplining, apiary tours, the observatory, leisure or mountain biking, and so much more! 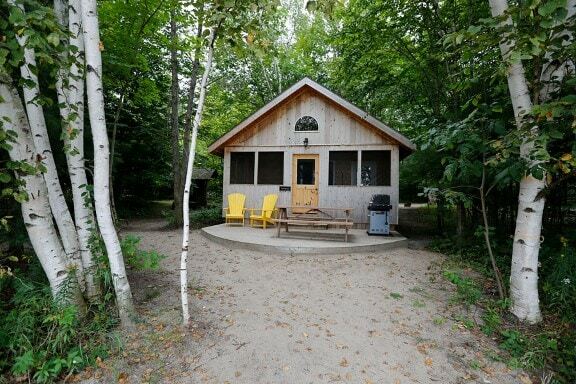 Ontario provincial parks sure have upped their game when it comes to accommodations. 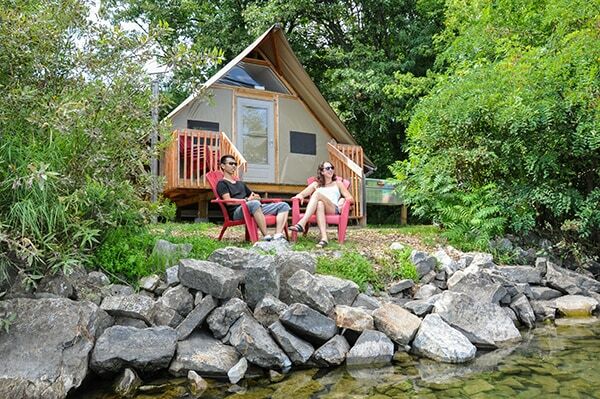 Check out the following parks for yurt and deluxe tent rentals—built on platforms with furniture and in some cases electricity: Algonquin (Achray or Mew Lake) Bon Echo, Bronte Creek, Charleston Lake, Killarney, MacGregor Point, Pancake Bay, Pinery, Silent Lake, Windy Lake (Murphy’s Point and the Pinery). Haliburton Forest is a wonderfully, sustainably managed tract of land. In addition to the awesome treetop trekking canopy tour, there is a wolf centre where the family can listen to wolves howl and learn more about these fascinating creatures. In terms of accommodations, there are two-bed, three-bed, and open loft-style cabins to rent so that you have plenty of time to explore. Can’t get enough of Georgian Bay? We don’t blame you. The rustic waterfront cabins are perfectly located at Cedar Spring and Christian Beach and offer hiking, biking and the lake itself just out your front door. And yes, boat transport from Honey Harbour to Beausoleil Island is included! This service is like AirBnb for glamping, with options ranging from tipis to tree houses with some gorgeous cabins in between. You’ll have a ton of fun zooming in on your preferred locale and then seeing the options available.